With one hundred and sixty five thousand people, 40 square miles of land, Tempe, Arizona packs the city life vibe into a small town atmosphere. Tempe, Arizona’s seventh largest city, makes for a perfect tourism destination due to its central location. Tempe is just minutes out from bordering cities: Phoenix, Chandler, Scottsdale, and Mesa, and is a convenient ten minute drive to Sky Harbor International Airport. 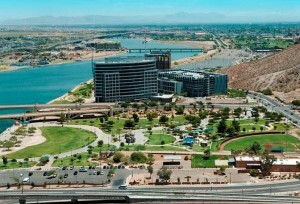 Tempe offers a wide array of activities for all ages and interests, and has over 44 hotels to accommodate any traveler. For a golfer interested in more casual and relaxed rounds, Tempe is the place to be. The historically-packed city is renowned for its highly-ranked public and municipal courses, and is far less known for high-end resorts. Some of Tempe’s best golf courses include: ASU Karsten, Ken McDonald, Rolling Hills, and Shalimar Country Club. All of these courses are open to the public and have affordable starting rates. ASU Karsten is home to the Arizona State University’s Sun Devil golf program, one of the most elite programs in the nation. This 18-hole course opened in 1989, and is recognized as a classic Pete Dye link-style design. ASU Karsten offers a challenging layout with rolling hills and plenty of bunkers. Phil Mickelson and Grace Park are among some PGA and LPGA Professionals who have played at this premier facility. Come and perfect your game at Karsten for rounds starting as low as $55. Ken McDonald is a classic par 72 course, running 6,700 yards in length from the championship tees. The course was designed in 1974 and is now is municipally owned, allowing for affordable golf rounds. Tee time prices start at $26. Rolling Hills executive 18-hole Golf Course comes in at an easier par 62. It is one of the valley’s finest courses nestled in Papago Park. The desert terrain provides a pleasurable experience for any skill level, and rates start at $28 all year round. Shalimar Country Club may sound exclusive, but it is actually very popular for players on a budget. The country club boasts its historic background, designed in 1960, and its unique territory. The course fairways are surrounded by tress, and the fifth and ninth hole are bounded by water. Although this course only has nine holes, it provides an opportunity to perfect distance control and accuracy. The best part: rates begin at $7. With Tempe not having a lot of territory, the city sure does know how to pack in a lot of entertainment. The Tempe tourism office provides information regarding the city’s history and culture, as well as recommend, shopping destinations, dining, nightlife, sports, and special events. 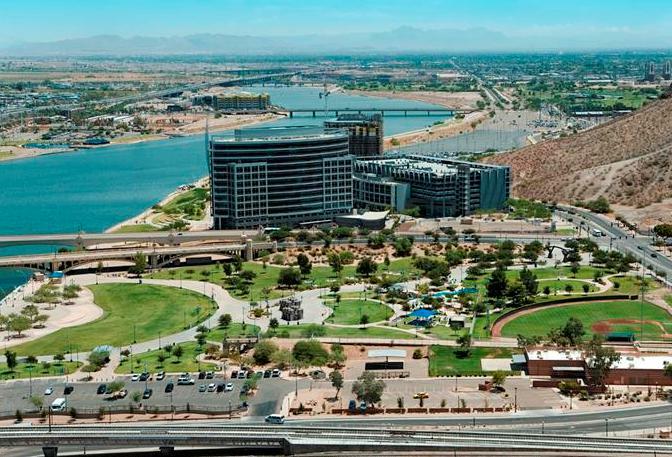 Come down and enjoy Tempe Town Lake where you can rent a boat or kayak, shop at Arizona Mills and Tempe Marketplace, or even enjoy a stroll down Mill Avenue. Further out of downtown Tempe, visit Big Surf, a water park with slides, pools, and activities for all ages. Tempe cannot be referred to without including ASU. Tempe is home to the main campus of the Sun Devils, and the college hosts many activities for the community. Come watch a Broadway production at the ASU Gammage Theater, attend a football or basketball game at The Sun Devil Stadium and Wells Fargo Arena, or enjoy an easy hike up Tempe Butte, also known as “A” Mountain. Tempe is the perfect tourist destination for an Arizona golf trip whether traveling individually or with a family. Come out and enjoy a casual round of golf, and after explore some of the numerous activities offered in the tight knit community!